Planning to travel abroad for some days or months? Well, then, now is the time for you to be a savvy traveler. And when you want to be a boss traveler, you would always want to avoid stress and save a huge amount of money. Now, while you are set to leave for a global trip, the biggest money guzzler is for sure going to be communication. Communicating with your peeps overseas costs you much if you trust on your local operator. Not only does it break the bank, but your heart, as well, when you are to pay for those global roaming charges, including making and receiving calls and texts as well as data. So, essentially, as a globetrotter, you should get your phone activated with a worldwide SIM card that not just saves your money but offers much more peace of mind, as well. Enter the revolutionary world of Pix World— one of the best SIM cards, which is specifically designed for those budget-conscious globetrotters who want to go global but affordable. 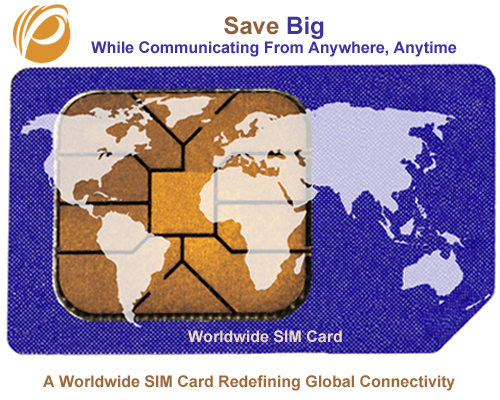 As an ideal worldwide SIM card, Pix World aims at streamlining communication for all time. Below, we’ve tried to cover a few key highlights that make this card the best option for any international traveler. This international SIM card allows you to enjoy communicating free of cost in more than 195 countries and over 220 cruise ships. 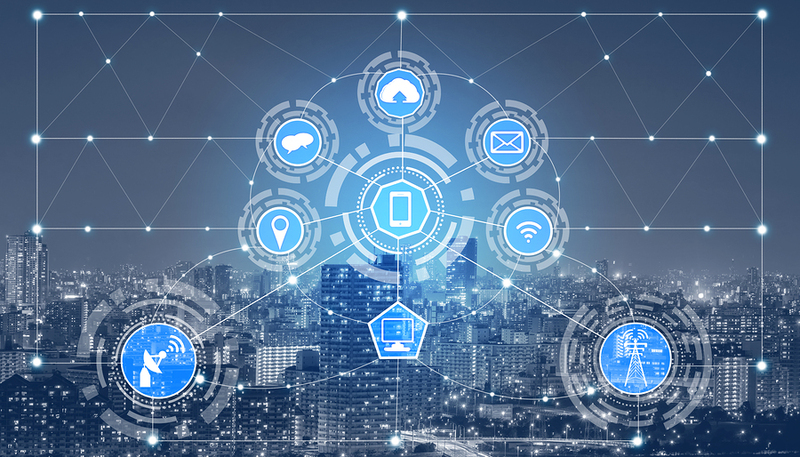 All you need to do is to simply brining your unlocked device—smartphone or tablet—and reimagine the way you communicate in your own community or while traveling abroad. Best of all, the worldwide SIM card allows you to enjoy all these facilities at rock bottom price. Kudos to a variety of prepaid plans available to buy on the market, Pix World guarantees you that your money is saved while you are enjoying global communication. So, whenever you choose to go with any of the Pix World’s plans, you will be able to save up to 120 percent on roaming charges. With the Pix’s Worldwide SIM Card, you will be able to access data for maps, web browsing, or e-mails at rates that are much lower than what your local operators offer. What’s more? This mobile carrier bills you for the data based on your location in 10KB or 1KB increments. Overall, it’s one of the most affordable options for international travelers who trust on data. Pix World brings to you mobile miles programs, which means earn while communicating. This is a very delightful service under which, users are given some of the most flexible loyalty programs available in the telecom sector. So, enjoy earning bonus miles while talking and use the earned miles for booking tickets in airlines or hotels. To be brief, Pix World takes you to the next level with their flexible loyalty programs. So, if you are planning to travel abroad, just start browsing through the Pix World’s collection of roaming charges levied for texting, voice calling and data usage. Once you succeed in finding an ideal as per your budget, preferences, and travel destination, buy it. This is because staying connected with your friends, families, and colleagues is all that matters most when you are staying abroad and left stranded by your existing mobile carrier. When you plan to travel abroad, the only thing you wish is how to get connected to all your near and dear ones within a fraction of cost. While you have a lot of options in terms of world travel SIM card, just a few can be trusted when it is a matter of reliable, affordable and speedier mobile connectivity and mobile wireless freedom. So, here comes the universal world prepaid SIM, which has fully redefined the affordability and revolutionized the mobile connectivity as well as wireless freedom. Pix World is an ideal universal world prepaid SIM card that you can use to enjoy free communication with your smartphones and/or tablets whether in your community or traveling abroad. Active in more than 193 countries worldwide, the users of this SIM card can enjoy comfortably making and receiving phone calls to all their closed peeps. They can enjoy sending and receiving SMS texts, and/or access data on the worldwide web at a fraction of the cost. Want to save up to 85% on roaming charges? Use Universal world prepaid SIM card! 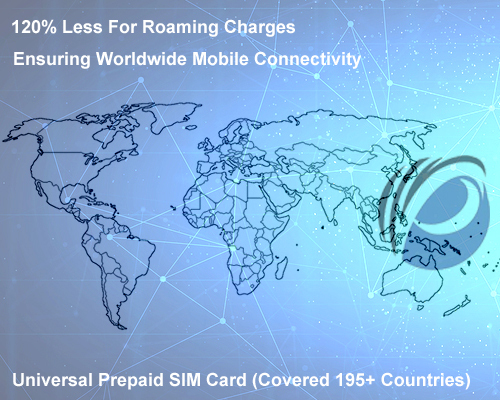 Whether you are a globetrotter and/or occasional vacationer keep traveling to abroad or sailing at sea; Pix’s world prepaid SIM card will surely help save you up to 120% on roaming charges as compared to the local network operators and the mobile carrier makes it all possible through callback service when you place outgoing international calls. When a Pix World user uses his/her cell phone to make an international call – the universal world prepaid SIM card picks up the call, connects it to the number you dialled and calls you back instantly. This way, it is able to connect the two lines at the same time. The mobile carrier even ensures you a secure connection and superior sound quality as you travel exclusively with worldwide partner networks. Getting ready for your next trip abroad and/or sailing the 7 sea’s on your next cruise ship vacation? Unlock the amazing wireless freedom and mobile connectivity by inserting Pix universal prepaid SIM card in your devices including smartphone/tablets and go global without hassles. The Pix universal world prepaid SIM card facilitates you global coverage in more than 193 countries and over 200 cruise ships along with the free services, benefits and features. All these amazing features of Pix universal world prepaid SIM card are sure to keep you connected to your world. Whether for yourself, spouse, family members, friends and/or colleagues; Pix’s Universal World Prepaid SIM Card is the perfect primary or backup solution for your wireless needs. Traveling abroad? Concerned about how you’ll stay connected with your folks back home? Well, if you nod in the affirmative, you’ve just hit the jackpot by landing on this page. Introducing to you Pix World! Pix World offers best-in-class world SIM card that your money can buy right now. Well, now, you must be thinking, What makes Pix World so special in the first place? There are two reasons for that—and, here, we’ll explain each of the two. Alright then, when you insert a SIM card from Pix World in your unlocked device, you’ll receive sensational coverage that’s hard to find elsewhere. Most international SIM card companies just claim to provide world-class coverage. But Pix World is different—it not just claims to offer sensational coverage but even delivers that every time. 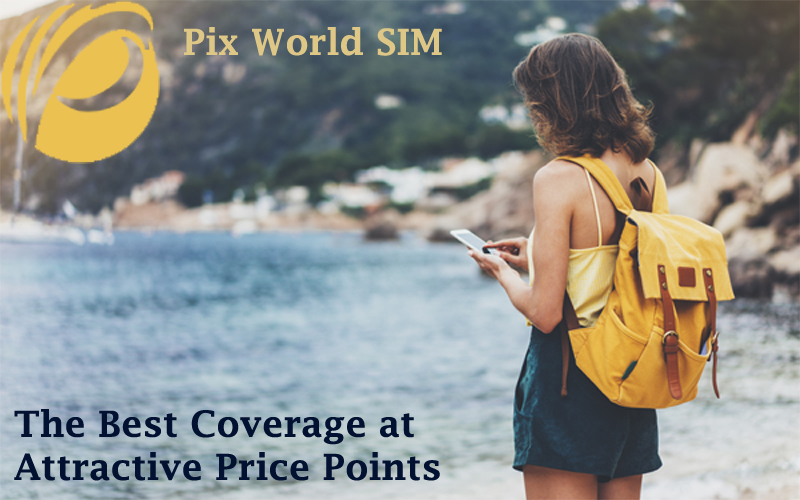 To be precise, when you insert a SIM card from Pix World, you’ll receive top-of-the-line coverage in more than 193 countries and over 220 cruise ships. Now, how does Pix World manage to deliver such awesome coverage? The answer to this question lies in the company’s expansive network. This network comprises more than 150 telecom operators that work on high-speed 3G and 4G networks. This way, when you have Pix World in your corner, you don’t have to think about patchy coverage, call drops, or undelivered messages. Now, this sort of coverage often costs a bomb. After all, everything that’s good comes at a good price. Yes, Pix World’s coverage is good—but it doesn’t cost you a lot. Pix World is based on a simple creed: Wireless freedom should be experienced by almost every international traveler. Which is why, this company makes sure that almost all the wireless plans offered by Pix World will be super affordable. In fact, if you stick to a specific plan from Pix World, you’ll easily save more than 120 percent of your roaming charges very easily. So, what’s the wait now? If you want to own a world-class world SIM card, just see the plans that Pix World is offering, period! While traveling abroad, you need to stay in touch with your folks back home. It’s your basic need. But it seems that the fulfillment of this need is easier said than done. Why? Well, because global roaming isn’t that easy to manage. So, the question is this: How’ll you manage global roaming just like a boss? And the answer lies in Pix World. Well, Pix World is a universal prepaid SIM card that’ll streamline the way you manage global roaming. Up next, we’ll tell you what makes Pix World one of the best world SIM cards in business right now. As an international prepaid SIM card, Pix World makes sure that it delivers best-in-class global roaming. 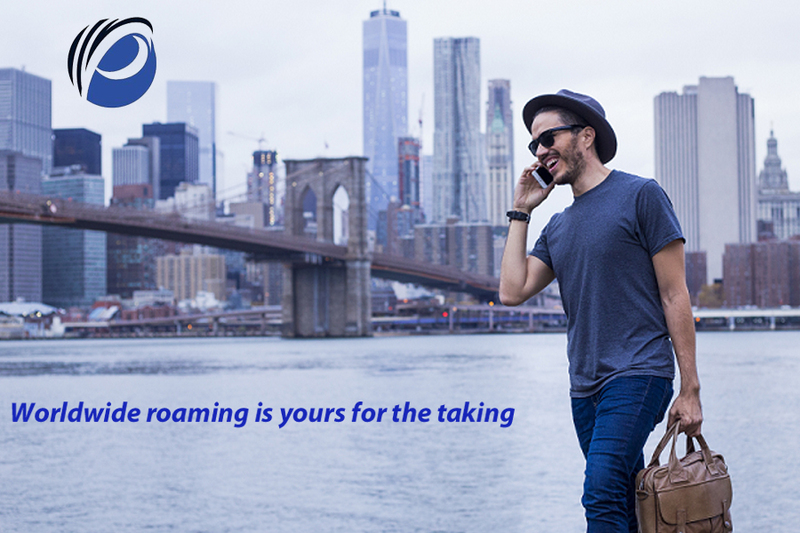 To be precise, global roaming is experienced by every Pix World user in more than 193 countries and over 220 cruise ships. And the main reason for the awesomeness of this network coverage is none other than Pix World’s network. This network comprises more than 150 telecom operators. And, best of all, these operators work using high-speed 3G and 4G networks. That’s how Pix World’s coverage is almost flawless across the world. Now that you know about Pix World’s ability to manage global roaming, it’s time to know about its affordability. Generally, this sort of sensational coverage can be all yours at rates that’ll break the bank. However, Pix World is different in this regard. First of all, whenever you’re buying from Pix World, you’ll get a number of wireless plans to choose from. To be precise, if you insert a SIM card from Pix World inside your unlocked device, you’ll easily save more than 120 percent of your global roaming charges. So, that means when you’re having a SIM card from Pix World, you’ll achieve stellar coverage at really attractive price points. Now, don’t think much. Just pick a wireless plan from Pix World and be ready to stay connected with your world while you’re on the move. As an international traveler, you’ll think of staying in touch with your folks back home. And having that thought—that feeling—is obvious. Remember, humans are social animals. The real deal, however, is staying connected with your people during the course of your journey. You know, if you’re stinking rich, you’ll stay connected by taking your homegrown network abroad. It’s as simple as that. But most of you can’t afford the high bills that are the result of taking your native network overseas. So, what do international travelers like you do for managing global roaming? Well, they’ll have to get one of the best World SIM cards out there. They have to get Pix World. Pix World has risen as one of the topmost international prepaid SIM cards on the market. Well, Pix World has got a huge network of 150 telecom operators. These operators work on high-speed 3G and 4G networks. So, this way, when you’re connected to Pix World’s network, you won’t experience call drops or patchy coverage ever. 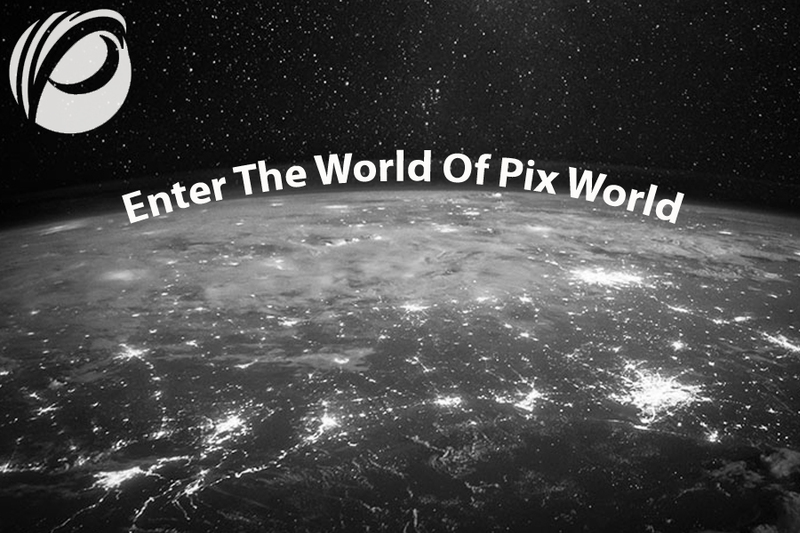 Because of this network only, Pix World users can experience sensational connectivity in more than 193 countries and over 220 cruise ships. Now, you know Pix World’s network coverage is really good. But what’s the deal with its affordability? Well, to be precise, Pix World lets you stay connected with your world without breaking the bank. That’s why Pix World has a range of wireless plans that are available at affordable price points. In fact, if you stick to a plan from Pix World throughout your trip, you’ll save more than 120 percent of roaming cost. So, what’s the wait for? If you’re traveling abroad and want to stay connected with your world, then get a SIM card from Pix World inside your unlocked device. And never let global roaming bother you. When you travel overseas, you have to make sure that you’re connected with your world—no matter where you are. But that rarely happens. It seems that worldwide roaming is quite hard to manage. And if you own just any other world SIM card, you won’t be able to nail global roaming just like a boss. In short, you’ll have to resort to the best world travel SIM card—something that’ll help you manage sensational global roaming even if you’re on a tight budget. In short, you’ll need Pix World. 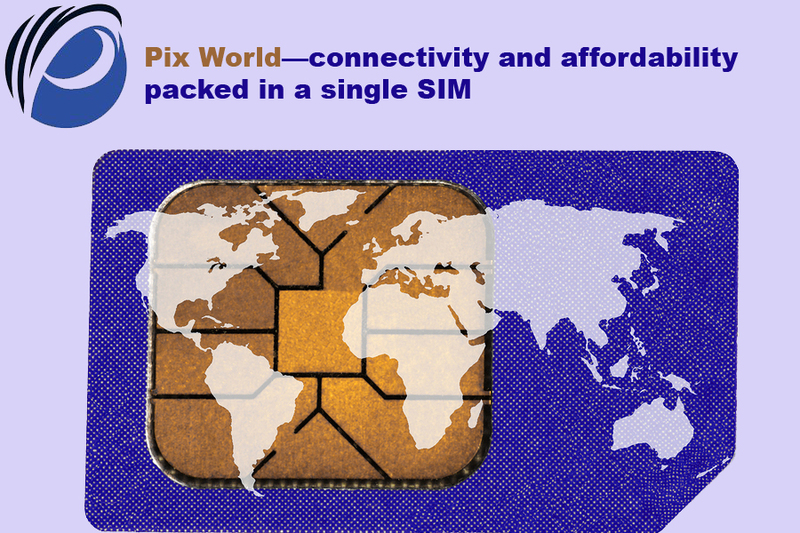 Pix World is one of the leading world SIM cards available on the market right now. This global SIM solution provider delivers the best coverage at rates that won’t cost a bomb. While discussing global coverage, we can’t neglect the fact that Pix World offers coverage in more than 193 countries and over 220 cruise ships. And this awesome coverage is only possible because of Pix World’s commitment to letting travelers stay connected with their world. Besides having a strong commitment, Pix World has got a robust network of over 150 telecom operators. These operators work on high-speed 3G and 4G networks so that its users stay connected all the time. Now that you know about Pix World’s awesome coverage, let’s discuss the price at which it can be yours. First things first, Pix World offers many different wireless plans so you’re basically spoilt for choice. These plans let you save a lot of your money on global roaming. To be precise, if you buy a plan from Pix World and stick to that one throughout your trip, you’ll easily save more than 120 percent of your roaming charges. Isn’t that a lot of saved money, partner? Of course, it is. To sum up, we’ll recommend Pix World to anyone who’s serious not just about traveling but even about staying in touch. So if you want to manage global roaming, you need Pix World in your corner. International travel comes with a lot of work. First off, you’ve got to get your visa cleared. Then you have to pack your bags—and it’s no easy task, mind you. But the most important and difficult thing that most international travelers put on the back burner is global roaming. Many globetrotters take international roaming for granted. Indeed, these people are wet behind the ears. Well, as an international traveler, if you aren’t managing worldwide roaming, you aren’t doing anything to stay connected with your world. The deal is that you’ve got to find a way—a pretty robust one—for managing global roaming. And when it comes to managing global roaming like a pro, it comes down to Pix World. So, Pix World is an international prepaid SIM card that’s got affordable wireless plans. But, hey, Pix World isn’t only about affordability—it’s even about offering best-in-class connectivity every time. Well, that’s exactly what makes Pix World one of the top World SIM cards on the market today. Now, let’s discover in detail all that’s making Pix World the pick of the bunch. Being one of the top world SIM cards, Pix World delivers amazing connectivity. If we delve into details, then Pix World is delivering sensational coverage in more than 193 countries and over 220 cruise ships. Well, that means just one thing—when you insert a SIM card from Pix World inside your unlocked device, you’ll easily stay in touch on land and sea. And this solid connectivity will be brought to you by an equally solid network. Yes, Pix World has a vast network that comprises more than 150 network operators. The best part is that these operators work on ultra-fast 3G and 4G networks. So, you can finally leave all those annoying call drops, patchy connectivity, and undelivered messages behind once and for all. Now, you know Pix World means quality. But what’s the price you need to pay for this quality, anyway? Well, rest assured it won’t be eye popping. Pix World wants its quality to be experienced by everyone. That’s basically why the company offers wireless plans that are super affordable. To be precise, if you stick to a wireless plan from Pix World, you’ll easily save more than 120 percent of your roaming charges. So, now, you know which international SIM card should you chose whenever you travel abroad. But make sure you browse through different wireless plans offered by Pix World before picking the one for yourself. When you’re traveling abroad, you’ll want to stay connected with your world. But it turns out that staying in touch with your folks back home is one of the most difficult tasks to pull off. Well, because global roaming is difficult to manage. So, long story short, you’ve got to manage global roaming—and that management should be done like a boss. Now the million-dollar question that’s coming to your mind is, How’ll I manage this global roaming in the first place, huh? That’s where a world travel SIM card steps in. But since there are many universal SIM cards on the market these days, finding the best one is often easier said than done. Well, so we’re bringing this set of features that every top global SIM solution should have. Without any delay, let’s get down to the details. A good international SIM card should have two things. The first thing is about delivering world-class coverage. And the second one is related to affordability. Both of these two things are important. There’s no two ways about it. Having just one out of the two will not do—come what may. Now, which universal prepaid solution will deliver awesome coverage at an affordable price point? The answer is Pix World. Okay, so Pix World delivers the ultimate coverage that money can buy right now. But the best part is that this expansive coverage comes at super pocket-friendly rates, to be precise. First off, let’s discuss network coverage. So, how much expansive is Pix World’s network? Well, in simple words, when you insert an international prepaid SIM card from Pix World in your unlocked device, you’ll be covered—like, literally. And the answer lies in Pix World’s extensive network. Yes, this telecom company has a very strong and wide network that includes network operators that go north of 150. These operators work on high-speed 3G and 4G networks. So call drops and undelivered messages and patchy coverage are definitely a thing of the past when you’ve got a SIM card from Pix World. By having such a wide network, Pix World provides sensational connectivity anytime, anyplace. Now you know Pix World offers stellar coverage. But is it really affordable? Can it be owned by a globetrotter who’s traveling on a budget? Well, yes. To begin with, Pix World has a range of wireless plans—and each of them is priced affordably. In fact, if you stick to a wireless plan from Pix World, you’ll easily save more than 120 percent of your roaming cost. Now, that’s definitely a lot of saved money, you see. Now, you know why it makes complete sense to go with Pix World if you’re traveling abroad. This is one of those rare international prepaid SIM cards that give you best-in-class coverage at affordable rates. So, get your prepaid plan from Pix World. And then be ready to explore the world while never losing the touch with your folks. Well, then, you’ve got to do a lot of things. To begin with, you’ve got to book your tickets. Then you’ve got to get your Visa approval. Like that, you’ve got to manage countless other things just to make sure your journey remains as smooth as possible. But have you ever considered managing global roaming as well? The thing is that many people put international communication on the back burner. Till the time they’re bitten by an astronomical bill amount charged by their native network service providers, provided that you’re taking it with you abroad. So, is there anything that can be done to improve this situation? First off, get a prepaid world SIM card for yourself. This way, you’ll take that one major step toward streamlining global roaming. Just like the way a pro international traveler should do. But you may get confused the moment you need to select the best world SIM card for yourself. Why? Well, because there are so many international prepaid SIM cards available on the market that you’re likely to get confused. But you needn’t stay confused forever. Because, here, we’ll give you the name of that one global prepaid SIM card that’ll let you manage international communication easily and, most importantly, affordably. Pix World is the best SIM card in business because it does two things properly. These are the two things that every telecom company offering international SIM cards should actually do—but most of them don’t. So, let’s get to know these two things now. The best coverage means you’re connected to your world anytime, anyplace. That sort of coverage is what Pix World is bringing to the masses. But how’s building that level of coverage even possible? Well, it’s possible because Pix World has got a huge network of telecom operators. To be precise, this network includes more than 150 operators where each of them works on high-speed 3G and 4G networks. This way, when you’re connected to this network of Pix World, you’ll get superior coverage all the time. What else? Since you’re connected to such a strong network, you won’t ever get to experience patchy connectivity or call drops or undelivered messages. And just in case you’re interested in numbers, Pix World will let you stay connected with your world in more than 193 countries and over 220 cruise ships. Isn’t that huge? Of course, it is. In short, when you’ve inserted a SIM card from Pix World in your unlocked device, you’ll experience super-strong network coverage. Okay, global roaming is indeed a big deal that usually costs you big bucks. Yes, usually—not always. So, Pix World is doing its best to make its worldwide coverage supper affordable for every globetrotter out there. Pick up any wireless plan from Pix World and you’ll notice just one thing—how affordably it has been priced by the company. In fact, if you stick to a wireless plan rolled out by Pix World, you’ll save more than 120 percent of your roaming charges. So, now, you know the complete deal about Pix World—and why it’s the best in business. And here’s one pro tip: Before picking any plan from Pix World, do a need analysis. Know clearly what you’d want from a wireless plan, and then choose the one for yourself accordingly. When you’re buying an international SIM card, you need a solution that’ll help you remain in touch with your folks every time. Most of the world SIM cards deliver decent network connectivity, but they don’t do that every time and everywhere. So, the deal is pretty simple—you need a solution that’ll not just deliver the best coverage, but it’ll deliver that sort of connectivity consistently. Yes, as someone rightly said, consistency is the only currency. So, all in all, you’ll need a world SIM card that’ll let you deliver the best global coverage every time. And finding such a SIM card is no walk in the park, not by a long chalk. Because there are so many international global SIM solutions available on the market that you’ll get confused for sure. That’s why we’re here with the name of the ultimate international SIM card that’ll let you achieve wireless freedom consistently and at attractive price tags. The name is Pix World. Pix World is the best global SIM solution for your money. Why? Because it packs connectivity and affordability. 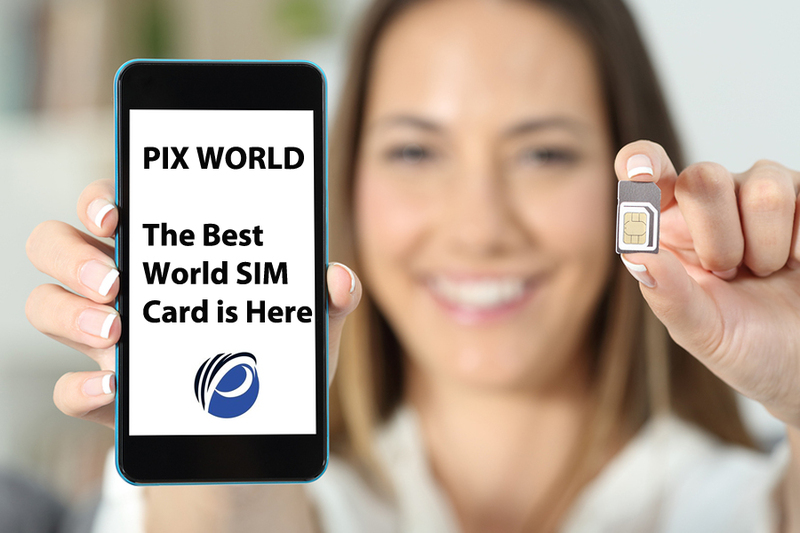 You may have seen international SIM cards that deliver either connectivity or affordability—but Pix World is different as it’s giving its users the best of both worlds. Let’s start with connectivity first. Then, we’ll head toward affordability. So, Pix World makes sure you’re connected with your folks back home no matter where you’re traveling. It’s as simple as that. For delivering the best-in-class network coverage, Pix World has built a super-strong network. This network includes more than 150 telecom operators that work on super-speedy 3G and 4G networks. Because of this network alone, Pix World lets its users experience flawless coverage all the time. And just by having this network in your corner, you can expect to stay connected in more than 193 countries and over 220 cruise ships. That’s what worldwide coverage should look like—in every sense of the word. Now, you know about the level of wireless freedom you’ll enjoy once you insert a SIM card from Pix World in your unlocked device. Let’s talk about the price that you’ve got to pay to enjoy this level of wireless freedom. Any wireless plan that isn’t affordable isn’t experienced by a lot of travelers. And Pix World doesn’t want that to happen to the wireless freedom it has built. After all, Pix World has worked really hard to create a super-extensive network of telecom operators. Now, if Pix World charges a lot for letting users access this network, then nobody will truly enjoy flawless connectivity. Because the network won’t have any takers in the first place. That’s basically why Pix World makes sure that its network is enjoyed by every international traveler. For that reason, Pix World has introduced a range of affordable wireless plans. And since there are so many wireless plans available with Pix World, there’s something that fits everyone’s needs properly. As a matter of fact, if you get a plan from Pix World, you’ll easily save more than 120 percent of the roaming cost. Now, that’s definitely a lot of saved money that you can use elsewhere during or after the trip. So, now, you know the reasons why Pix World is the best prepaid world SIM card available. Pix World does two things really well—it delivers true wireless coverage, and it brings that at attractive price points. 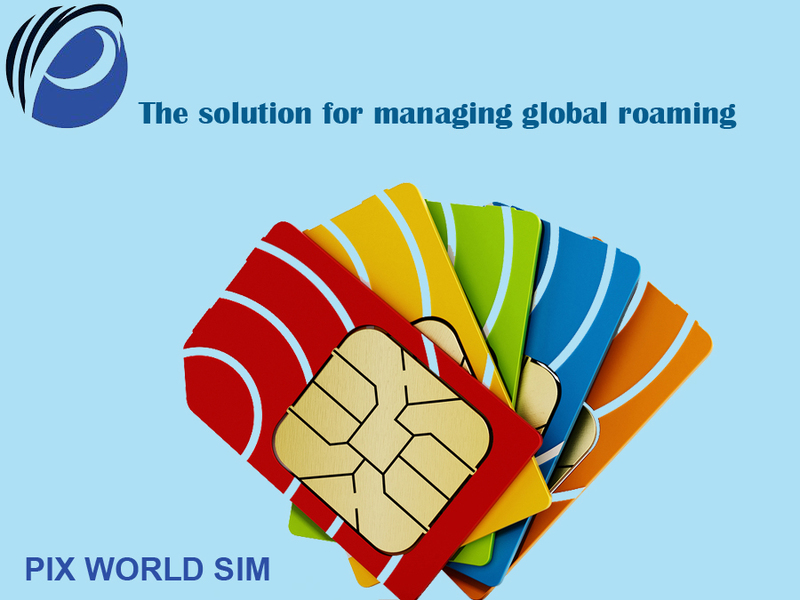 So, let Pix World manage global roaming for you whenever you travel abroad for work or pleasure. However, before you pick a plan from this telecom operator, make sure you’ve browsed through its entire range of offerings. This way, you’ll find the one that suits your needs really well.